New Hampshire Modern Quilt Guild: Workshop Success! Jacquie Gering was a huge success!! Jacquie from Tallgrass Prairie Studio presented a great workshop on Saturday! The class was sold out but she still gave individual attention to all of us. 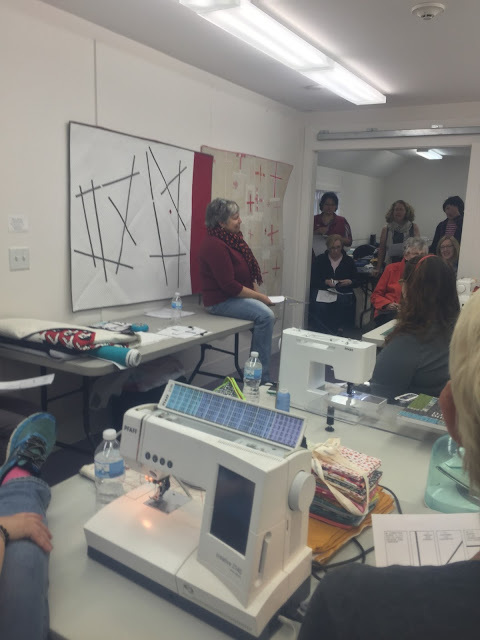 She taught us how to use the slice and insert technique for improv quilting, the types of inserts, and the variety of ways to put it all back together. 2 thumbs up to Jacquie! *** If you ever get a chance to take Jacquie's workshop I highly recommend it. This was such a great class! Jacquie has a great sense of humor and a lot of patience! She knew exactly what to say to get us thinking about what we were doing. I really enjoyed it a lot!